Mission: Deep-Sea Corals and Benthic Habitat: Ground-Truthing and Exploration in Deepwater Canyons off the Northeastern Coast of the U.S.
We’ve seen amazing and beautiful animals living in these deep water canyons, many of which I did not recognize. During the progression of each tow I find myself asking the scientists around me, “What is that?” But that is what science is all about: being curious and trying to obtain the answers. No matter how many hours I’ve sat on watch, or how many TowCam images I’ve looked at on the computer monitor, it’s still exciting to be one of the few people who get to see images directly from the ocean floor! It’s incredible that a large metal apparatus with a camera can send images and data thousands of meters through a tiny cable back to computers on the ship. As the pilots navigate TowCam through the water, images are sent back to the ship every 10 seconds. Image highlights taken using TowCam during the Canyons CSI research expedition. So what do we see in the images that are being sent back? I’ve gotten to see amazing things living more than a mile below the ocean. These include octopods and squids, skates, sea pens, anemones, delicate brittle stars, bivalves, and lush colorful coral gardens. All these organisms live on the bottom of the ocean in cold, dark water and under extreme amounts of pressure. 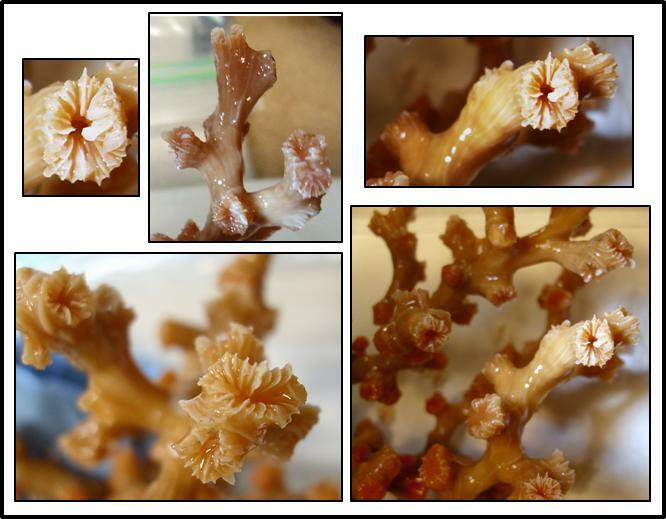 Morphology: The structure of a corallum. How many different kinds of deep-sea corals are living at the bottom of the ocean? At least 71 species are known to occur off the northeastern coast of the U.S.; and new species are likely to be discovered. Many of the deep-sea corals look similar in color or structure. How do scientists tell them apart? They use taxonomic keys and DNA analysis to identify species. Dichotomous keys are a systematic way of identifying organisms by making a series of choices based on an organism’s characteristics. These keys are particularly useful if you don’t have instrumentation to conduct a DNA analysis. Earlier this week, marine ecologist Dave Packer from NOAA’s National Marine Fisheries Service taught me how to use a dichotomous key for deep-sea corals. Corals are actually animals, even though many of them look plant-like in shape, so they belong in the Kingdom Animalia, the Phylum Cnidaria, and the Class Anthozoa. 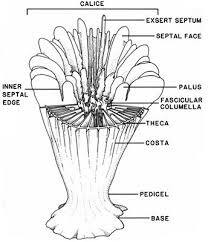 We began by discussing animals in the four Orders of deep-sea corals within the Anthozoa that are found off our northeastern coast: Scleractinia (stony corals), Antipatharia (black corals), Alcyonacea (soft corals and sea fans), and Pennatulacea (sea pens). Compare the corals shown below. You will notice that each group has a different style or appearance. Even though corals appear to be morphologically simple animals, they are highly detailed. Individual corals can be very small. Look at the image to the left to become familiar with some of the structures. Below are some additional features that may be found on different types of corals. Is it solitary (grows alone) or is it colonial (grows with other coral polyps)? Are the septa (fins sticking out at the top) smooth or rough? Are the coral polyps only on one side, or scattered in a random pattern? Is the coenosteum (portion of the skeleton between the polyps that looks like tree branches) porous or smooth? Corals reproduce by “budding.” Do new corals bud inside an older coral (intratenticular) or are polyps added to the outside near older coral polyps? Does it have 24 septa? Check your answers below to see if you got these questions correct! Drum roll, please… This coral is Solenosmilia. Try pronouncing that one! Going through an actual dichotomous key requires answering many more questions and making more choices. Coral polyps and structures can be so small that often a microscope is necessary to look at some parts. Sometimes corals may look very similar, so DNA testing is conducted to confirm the identification. Dichotomous keys can be used in identifying many other types of organisms as well, such as plants and fungi. Want to try your hand at using a dichotomous key? Try this sweet activity using candy! 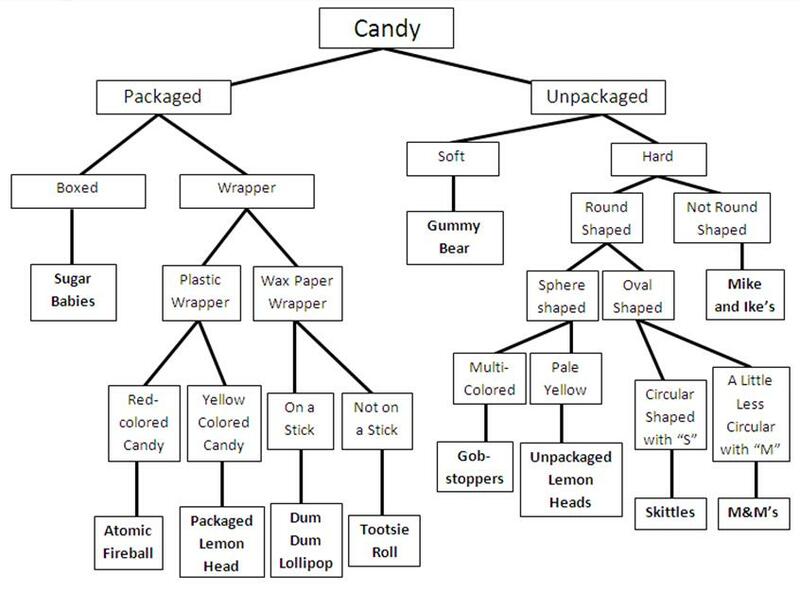 Think about the characteristics of the candy pieces listed in the picture and key: Skittles, M & M’s, Gummy Bears, packaged Lemon Heads, unpackaged Lemon Heads, Dum Dum lollipops, Sugar Babies, Atomic Fireball, Mike and Ike’s, Tootsie Rolls, and Gobstoppers. What characteristics do they have in common? If you were going to sort them, how would you begin? We’re going to start with packaged versus unpackaged. Continue to follow along with the Candy Dichotomous Key until all the candy is sorted. How are the candy pieces similar? How do they differ? 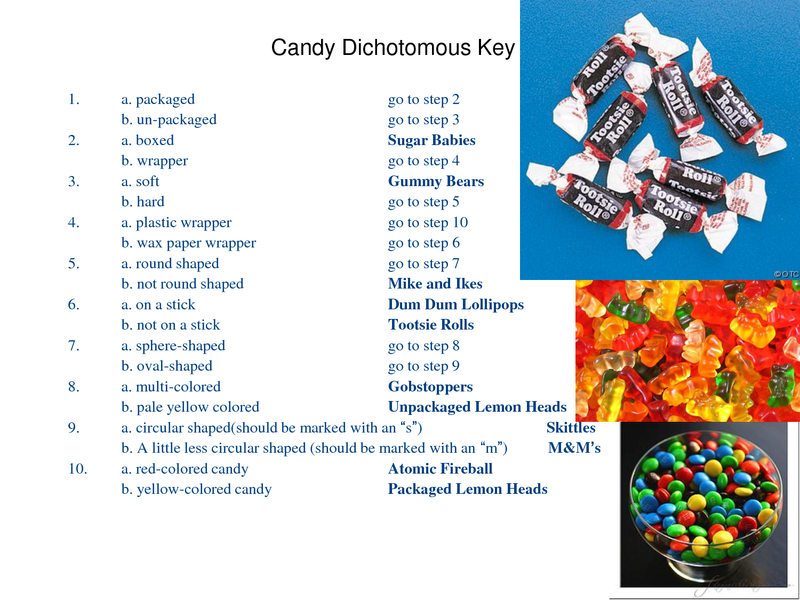 You have now used a dichotomous key to identify candy! These corals are intratenticular – notice how some appear to be budding off from one another. One of my favorite marine organisms is the starfish. We have seen many brittle stars during the course of our research expedition. There have been many large white brittle stars, and many tiny pink brittle stars that live symbiotically with certain corals. Corals are actually animals? They belong in the Kingdom Animalia. Corals can live colonially, with other coral animals, or can be solitary and develop alone. 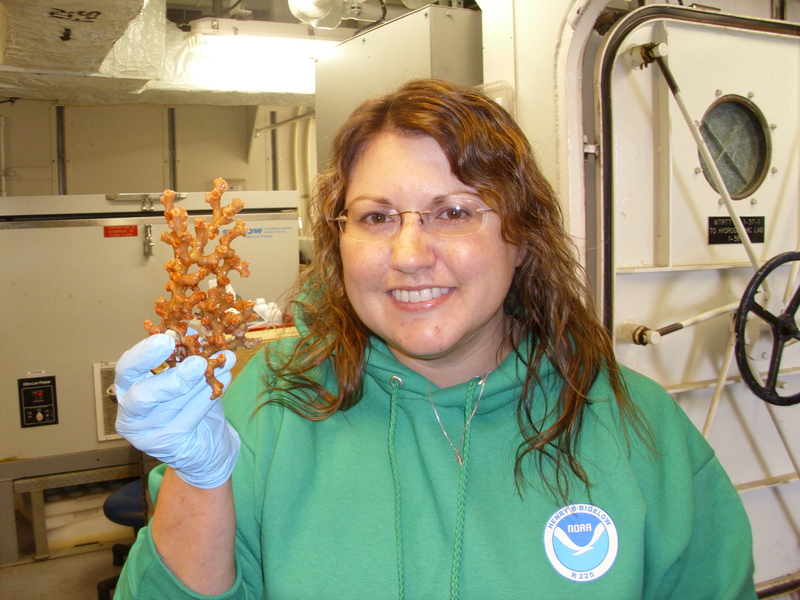 This entry was posted in 2013, Beverly Owens, NOAA Fisheries Service, NOAA Teacher at Sea and tagged Beverly Owens, coral, Corallum, Crest Middle School, Dave Packer, Dichotomous Keys, Morphology, NMFS, Solenosmilia, TowCam. Bookmark the permalink.